Virtual model of the last common ancestor of Polyneoptera. Credit: Benjamin Wipfler and Evgeny V. Yan. An international team of researchers has found evidence that shows that many modern winged insects developed from a terrestrial ancestor, not from one that lived in the sea. In their paper published in Proceedings of the National Academy of Sciences, the group describe their large-scale phylogenomic analyses of both Polyneoptera and Pterygota and what they found. Polyneoptera represents one of the most prominent lineages of winged insects (Pterygota). There are approximately 40,000 species of them in 10 orders. They include stoneflies, grasshoppers and roaches. The researchers note that they are the only major lineage of winged insects with a cloudy evolutionary history. In this new effort, the researchers sought to fill in many of the gaps that exist in their family tree by conducting a large-scale phylogenomic analyses of both Polyneoptera and Pterygota. This enabled them to trace phylogenetic relationships of 112 samples associated with the typical appearance and lifestyle of the winged insects. Their study also involved studying 106 species and 3014 genes. The researchers report that their analysis revealed that polyneoptera did not evolve from an initial sea creature, but instead, one that lived on the land. This finding contrasts sharply with the view that such insects evolved from creatures that swam into insects that buzzed above the water, such as dragonflies. Also, a sea evolution seemed logical, with wings developing from fins. The evolution of wings from a terrestrial creature would most likely have had to come about due to the advantage some received from falling from a higher place to one that was lower. 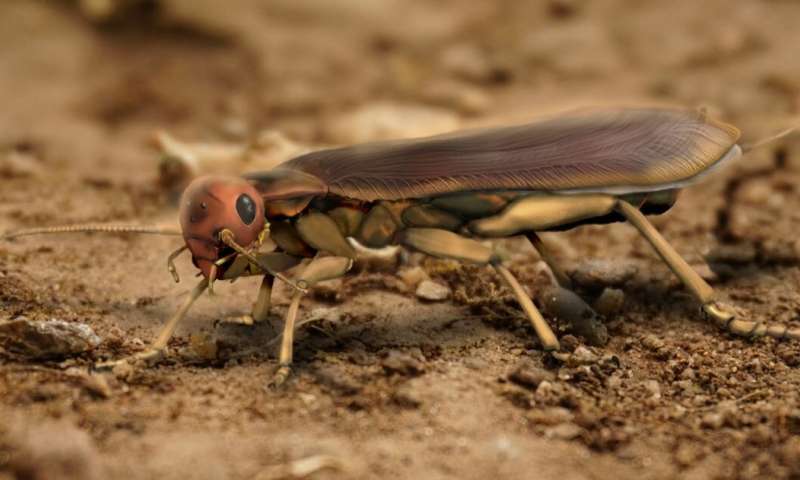 The researchers furthermore contend that the early land-dweller evolved from an insect that had antennae and a segmented abdomen. Also, it had biting mouth parts that were located beneath the head capsule, which would have been similar to the modern dragonfly. It would also have had stiff forewings making flight difficult and necessitating the development of triangular rear wings. The researchers note that their work was part of the 1,000 Insect Transcriptome Evolution Project (1KITE) which brought together international teams of researchers for the purpose of better understanding the evolutionary history of insects.